For social members you use your Member Card when entering the club, signing in visitors and accessing your member discounts at the club bars and dining outlets. Your Member Number is also used to identify winners in the Members Draw which is held every Friday Night. You will be given 2 accounts when joining, your Membership House Account, and a Bar Account. You use the Accounts section to check your statement. You can also place credit onto your account and present your card when making purchases instead of using cash. Any competition prizes you win will be credited to your account. Book in your game for member competitions, book fellow member playing partners or visitors. You can add contact details that fellow members can access to contact you, or use to select you as a playing partner. You can also change your password in this section. You can check your position in “live” competitions against fellow members during the day once you have entered your score, as well as reviewing the results of past competitions. You can also access your ball account when winning a ball in competitions, check your handicap and access the member directory. 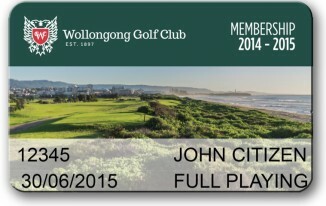 When joining Wollongong Golf Club every member receives their own personalised Membership Card.